Late in October, my daughter and I traveled to Theodore Roosevelt National Park, where magic happens for us no matter what see or do. We go there whenever we can. This time, we were there to join in with a research project that has taken place there for several years — banding Northern Saw-whet Owls. I assisted with this project in its first year and determined then and there I must take Chelsea at the next opportunity, which I did the following year. While this year the quest was quixotic and no owls were captured in the mist nets spread in the junipers, we always have the memory of the first time for Chelsea (above). We arrived at the park early this particular day and drove the loop road. There were very few visitors. We spotted lots of the feral horses and many bison. The autumn light was amber on the seed heads of the maroon little bluestem and other prairie grasses. Just the slightest of breeze and the lenticular clouds set the stage for a glorious day in the Bad Lands, after what has been a rather gloomy fall. I pointed out to the Chelsea that the green ash trees (Fraxinus pennsylvanica) have an unusual number of seeds. I don’t happen to believe that this is a “sign of a tough winter to come,” but rather more to do with the growing conditions of the particular season and other natural forces affecting the tree. I pointed out to Chelsea that those with the seeds are the female trees and the seeds are called “winged samaras” (a close examination of the seed demonstrates the “wing” portion of the name). Chelsea has a particular passion for the park’s wild horses, and these creatures dominate her Wild Dakota Photos social media. Here are a few shots she took last week. Photo by Chelsea Sorenson, Wild Dakota Photos. We found our way back to Medora to check into the hotel and get some supper. With the tourist season passed, it is a quieter time in the village, and we laughed at the tumbleweed blowing down the street. Back at Peaceful Valley Ranch, the cottonwoods were adorned with roosting wild turkeys. 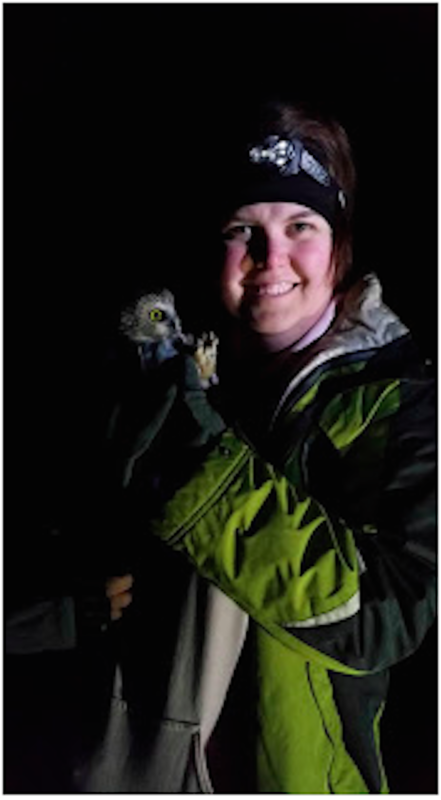 At the owl banding station, we got acquainted with the two women running the station this season. These biologists were very interesting and enjoyable company, and we went straight to work (after Chelsea wandered off to the nearby corral to say hello to the mule and horses the park stables there for work projects). It was just the four of us, at the table, in the dark, chatting, pausing to visit the nets at :20 and :40 on the hour. It was a very dark and star-filled night. One lingering Orionid meteor shot across the sky. Mars and Fomalhuat were low on the southeast horizon. Soon the rising Hunter’s Moon over the buttes flooded the Little Missouri River Valley with creamy flight. Nearby, we heard Saw-whet Owls and a Great Horned Owl hooting. One small owl darted by us. The researchers told us that it has been a slow year, here, and at other banding stations across the country, for reasons not clear. Sadly, we captured no owls this night. Here is a blog summarizing the project’s years in this location. I had just finished reading an excellent book about owls. One of the biologists knew some of the ornithologists featured in the book. At less than 3 ounces, the Northern Saw-whet Owl is one of the smallest of owls in America. There are a couple of North American owls I have yet to see that remain high on my to-do list, including the Flammulated and Great Gray Owls. I’ve written about my fascination with owls before, here and here. Sadly, no owls have yet nested in either the box or nest we’ve erected at Red Oak House. Someday. Just the other day, I read this fascinating story about the West Virginia mythical creature, The Mothman, thought to most likely be an owl, perhaps a Barn Owl or Snowy Owl. It is thought that we are so fond of owls because of their faces, with front-facing eyes, which seem almost humanlike. Goodness knows I’m enchanted with owls. As we drove back to Medora, we spotted a band of horses illuminated by the moonlight. For good reason, the park is well known for the abundance of wildlife viewing opportunities. After our heads hit our pillows, our dreams were filled with happy, wild memories. From time to time an owl hoots in the distance. Uttering their solitary moods of grief and joy and exaltation?